Valentine's Day is rapidly approaching. This year be sure to show your family how much they mean to you. It doesn't have to cost a lot or be an over the top celebration, just set some time aside to focus on your family and tell them you love them. 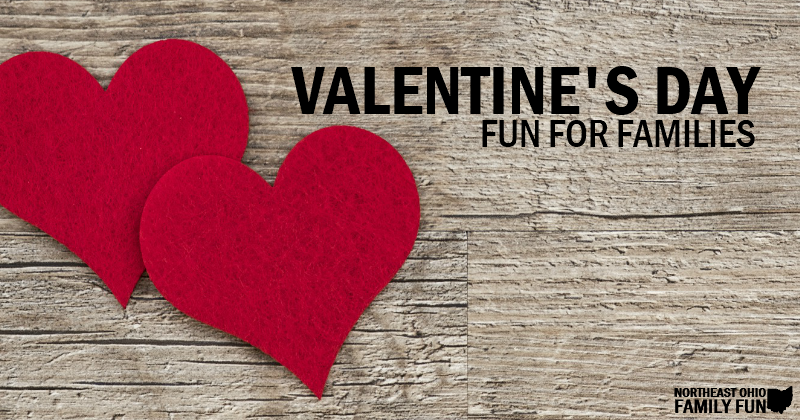 Below are some fun Valentine's Day-themed events and some other fun ways to celebrate the holiday with your children. If you know of any other events or ideas we should include, please submit the details here and we'll add it to the list. Thank You! Cost: 5 per swimmer or $15 per family max. Cost: Pricing ranges from $9.95-29.95, and includes dipping and assembly, gift box, gift note, and ribbon. Use a chocolate heart to turn ordinary Peanut Butter Blossom cookies into a Valentine's Day treat. If possible, encourage your children (young & old) to help you make them. That way you'll all be able to enjoy the end result and some quality time in the kitchen with your family. There a wide variety of crafts you can do together as a family. Just remember that the objective is not to have a perfect final product, it is to enjoy each others company. Celery stamped rose Valentine's Day cards – With a stalk or celery, some paint and your imagination you can create a beautiful rose valentines day card. Most importantly, don’t forget to tell the ones you love how much you appreciate them! Have a wonderful Valentine's Day! How are you planning to celebrate Valentine's Day with your family? Wow! Thanks for sharing all these great events.